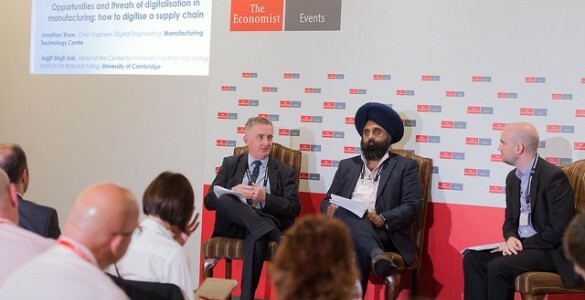 Dr Jag Srai, Head of the IfM's Centre for International Manufacturing, was a panellist at The Economist's Manufacturing Forum in June, attended by CEOs, CIOs, CTOs and other senior business leaders. The topic was 'The dawn of the connected industrial revolution' - the potential gains and challenges associated with the digitalisation of manufacturing. How can industry ensure a successful transition to 'connected manufacturing'? What are the key opportunities and threats facing manufacturers as a result of digitalisation? How is this impacting business models and factory floors? How can manufacturers balance investments between core business and new initiatives? Jag, along with Jonathan Shaw, the Manufacturing Technology Centre's Chief Engineer (Digital Engineering), led a discussion on the digitalisation of supply chains. They considered the potential benefits as well as the challenges of creating a truly connected manufacturing ecosystem and what companies need to do to offset the risks posed particularly by IT, security and HR. The other speakers at the event were senior executives from Airbus, ABB Group, GE Oil & Gas, Rolls-Royce, Hilti and Hewlett Packard Enterprise.